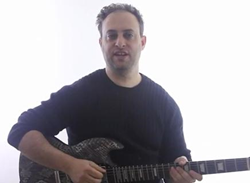 GuitarControl.com released a new video guitar lesson from GuitarControl.com instructor and creator Claude Johnson. In this guitar lesson, now available on YouTube.com, Claude Johnson teaches an easy blues turnaround on acoustic guitar. Claude demonstrates the turnaround in the key of E based around a 12 bar blues progression shuffle. This type of riff is a staple in the blues genre and is a must for any guitarist to have in their arsenal. Johnson does a great job of explaining how to perform the turnaround so even the novice guitarist can easily follow along. Guitar TAB’s are available for this easy beginner blues guitar lesson at GuitarControl.com.